Alix de Massy, plasticienne, diplômée de l'Ecole Nationale Supérieure des Beaux-Arts de Paris vit et travaille dans les Cévennes depuis une vingtaine d'années. les subtilités de la transparence et de la lumière. (Alain Freixe, Patrick Laupin, Joël-Claude Meffre, Bernard Noël). et inversement. Comment et d'où surgissent les formes? Le dessin arrive comme le dépôt de ce qui agit entre la pensée et la main"
Alix de Massy is graduated from Paris Fine Arts Superior School. 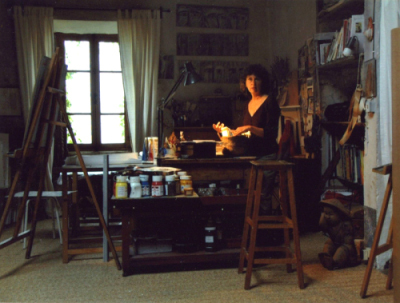 She left Paris some twenty years ago and settled in Southern France mountains (Cévennes), in Saint Germain-de-Calberte. Besides exhibitions and pedagogical activities, Alix also contributes a lot to art books in a regular dialogue with French poets (Alain Freixe, Patrick Laupin, Bernard Noël...). In her works, she uses papers of different sizes, sometimes very thin ones where shapes seem to be playing with the subtleties of transparency and light. And a very subtle energy and discrete vivacity come through. Above the faces, trunks, human shadows, we could read more a sort of lightened rythmical score. Each movement converges towards a unicity of shapes, a fusion of the hues constantly binding from one to another. «Breathing, hand practice, appropriate gesture, together create thought as well as being created by thought. How and where do shapes stem from ? A drawing occurs as would the kind of sediment produced by what interacts between hand and mind ».